Recently, one of the girls behind Cherry is addicted using cosmetic oils. She allowed me to try RMK W treatment Oil. Let me share with you my personal review of RMK W treatment Oil. “W” means water and oil. See, there are two colors on the bottle. Please shake well before using. Its orange smell reminded me Mikan, Japanese tangerine, you may also know as Satsuma. 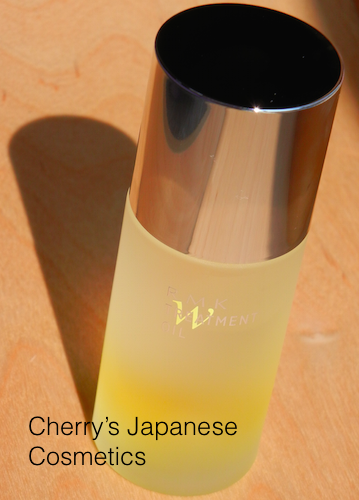 She is applying this cosmetic oil since this Spring, and this is her second bottle. Yes, she used even while Summer. Her skin is drier than me, and she is staying heavy air-conditioned office to work. She needs not only moist by water, but also moist by oil. Frankly to say, I do not want to use oily items when it is hot, or my skin is with pimples. My skin is getting drier, but I hesitate to use oils on Sep. …I applied. I had experienced to use cosmetic oil, THREE SQ Oil before, and I liked it. Both this RMK and THREE are quite runny oil, and no sticky. And I felt it is quit good to feel my skin was not oily but moist so good level. Wow. Please check the latest price, and order from here:”RMK W Treatment Oil“.